Value Wine Discovered...at a Steakhouse! 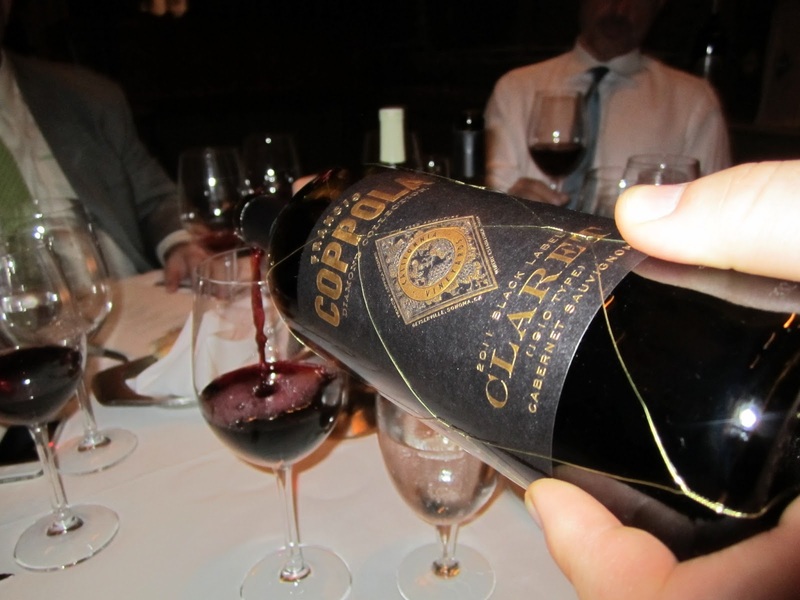 The Francis Ford Coppola Winery hosted a media dinner at Ruth's Chris in Boston last week. 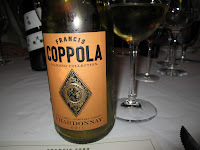 The purpose of the event was to increase familiarity with the Coppola offerings in the Boston area. I'd never been to this particular Ruth's Chris location, so it was a great chance to "kill two birds with one stone" while trying the Coppola wines in a fine dining setting. This Ruth's Chris location is situated within the old Boston City Hall. I'm pretty sure I'd heard the story of where the peculiar "Ruth's Chris" name came from, but I appreciated being reminded that it came about when Ruth Fertel purchased the Chris Steak House in New Orleans in 1965. That popular location burnt down so Fertel chose to open a new location nearby. Because she was only licensed to use the name "Chris Steak House" at the original location, she named the new restaurant Ruth's Chris Steak House. Today there are more than 120 Ruth's Chris Steak Houses, making it one of the largest fine dining entities in the United States. I've been to a handful of their other locations so when we walked through the door I immediately recognized the enticing aromas of their signature steaks served on piping hot plates sizzling with butter. 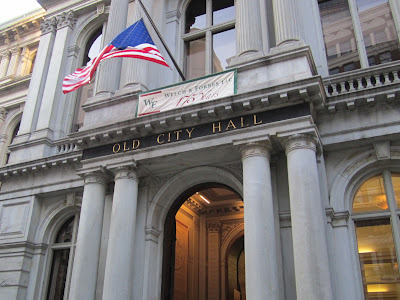 The event was held in a subterranean portion of the restaurant which overall looked to be very nicely built out, successfully blending Boston charm with comfortable modern elbow room standards. The evening started out with the 2011 Sofia Blanc de Blancs sparkling wine served with hand-passed hors d'oeuvres of Seared Ahi on Crisp Cucumber and Tomato Bruschetta Crostini. The Sofia line-up consists of a Riesling, a Rosé, and this Blanc de Blancs which is 86% Pinot Blanc, 12% Muscat, and 2% Riesling. It weighs in at 11.5% alcohol and retails for $19. The wine is made in a slightly off-dry style and I thought it offered appealing fruit characteristics of perfectly ripe pears and apples with the effervescence providing a nice lift without getting in the way of enjoyment. Like many of the wines we'd try, the Sofia Blanc de Blancs is distinctively packaged, in this case within a pink cellophane wrapper. This was the first of two wines we'd taste from their Diamond collection. A trend at California wine dinners seems to be describing Chardonnay and Pinot Noir as Burgundian. Folks asked what that meant and winemaker Corey Beck said it meant a focus on lower alcohol, higher acidity, and moderate oak influence. Though the alcohol was moderate (13.5%) wine didn't seem particularly Burgundian to me, but if you like your Chardonnay with a creamy texture and a crème brûlée finish this one's got it. The Chardonnay was paired with a Chilled Shellfish salad with tiger shrimp, lumped crab meat, spring greens, and white balsamic vinaigrette. The Diamond Chardonnay carries a $16 retail price. You'll find it on sale for $11 or $12 a bottle at retailers. This was my favorite wine of the night. I've been talking a lot about getting back to basics and seeking out affordable, enjoyable weeknight wines and this is one I consider meeting that description. It was a soft, plush wine with sufficient California Pinot markings (strawberries, supporting herbal notes, etc) that it felt like legit Pinot. It also featured just a touch of baking spice warmth yet bright fruit kept it feeling fresh. It paired very enjoyably with a Wild Mushroom Risotto featuring cremini mushrooms, fresh thyme, and Romano cheese. Fantastic comfort pairing. The best part? The Pinot retails for just $14, meaning you'll be able to find it at retail for just over $10 (search for it using Wine-Searcher) or for $8 by the glass in restaurants. I hear they sell tons of it at The Cottage in Wellesley and I believe it's poured at Ruth's Chris as well. This is the Coppola wine you've probably seen most frequently in wine shops, including Costco if I'm not mistaken. The bottle is wrapped in gold netting to signify it's one of their signature wines. The winery website is quite good - it includes a video showing how to open one of these bottles while retaining the netting. They're big on presentation: "It's all entertainment," says Francis Ford Coppola. The Claret is mostly Cabernet-driven wine (79%) but labeled as a Claret to denote the inclusion of other Bordeaux varieties. The wine retails for $21, though discounters seem to drive it down in the $12 range. That's a favorable price point to be paired with an 8 oz Filet & Lobster Tail Rockefeller (stuffed with creamy spinach and Romano cheese)! 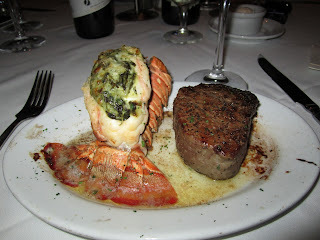 If you've never been to a Ruth's Chris, their signature move is delivering steaks to your table on very hot plates sizzling with butter. I wondered how they'd pull that off in this setting with 20+ people being simultaneously served in the room. Winemaker Corey Beck quickly sensed it was time to stop talking when the sounds and smells of the sizzling steaks entered the room! 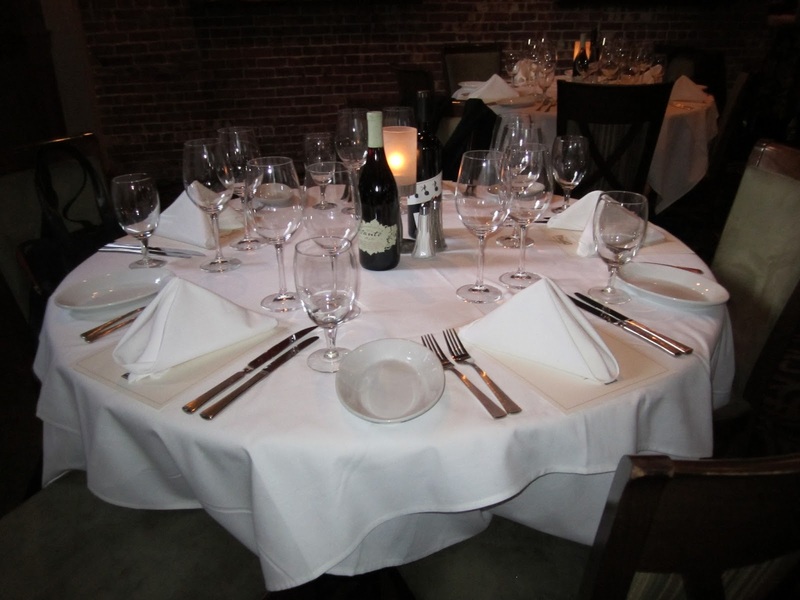 The restaurant did a fantastic job presenting the entrees concurrently. Dessert - a fantastic flourless chocolate cake with fresh berries - was paired with the Director's Cut Cab which was a nice step up from the Claret. The Director's Cut was denser than the Claret which I appreciated. Beck described the mindset of Director's Cut being analogous to a filmmaker deciding what he wants to keep in the final picture. In producing Director's Cut, Beck gets to decide which lots and barrels work best together when creating the final blend. It's produced from grapes from Sonoma's Alexander Valley and is a nice value at $29 retail, and available for less if you look around. 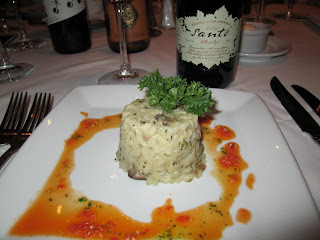 It was very enjoyable tasting these wines in the context of the food at Ruth's Chris. The Voltre Santé Pinot Noir is one in particular I'll gladly buy it next time I see it available at retail. The Director's Cut Cab was a nice wine, and I hear they make a Director's Cut Pinot Noir I'd also be interested in buying. The Coppola empire of endeavors is impressive. Filmmaking, wine, resorts... The list is long. Many celebrities get into winemaking as a side hobby that loses money. But in the case of Coppola's wine brands they actually kick off money that's in turn used to create independent films. Fascinating guy. I think I'll have to go back and re-watch The Godfather. Question of the Day: Have you tried the Coppola wines? If so, what did you think?